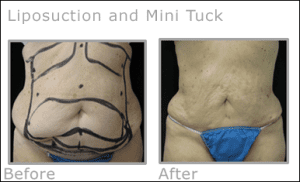 A panniculectomy (mini tummy tuck) is a procedure used to reduce the size of a disproportionately large pannus, or hanging tissue in the abdominal region, and is usually performed on patients who have gained or lost large amounts of weight. While weight loss can improve the health of many obese individuals, drastic weight loss, can leave behind large amounts of excess skin. The excess skin and fat in the lower stomach area that hangs below the belt line is called the pannus, or abdominal “apron.” Child bearing and different types of abdominal surgery can also leave scarring and stretch marks that further lead to the undesirable appearance of the abdomen. The extra fold or folds of skin can hinder hygiene, put stress on the back, and make everyday activities difficult. Often, the areas in the pubic region under the pannus can become moist as perspiration is trapped. Clothing may not fit comfortably. Who Is a Good Candidate for Panniculectomy? People who have lost a large amount of weight and are experiencing negative side effects due to excess skin in the abdominal area are good candidates for panniculectomy. Also, people with stretch marks, prior scar buckling and unwanted fat pockets can benefit from this procedure. A good candidate should have had stable weight for at least six months, and, if a woman, not be planning to bear children. A potential patient should also be following a reasonable diet and should be in relatively healthy condition. What does a Panniculectomy Involve? Panniculectomy is an invasive surgical procedure, which can take from three to five hours to complete. Unlike an abdominoplasty, panniculectomy does not tighten muscle. Most often, liposuction is performed prior to the excision of the pannus and if needed, repositioning of the belly button is also done. A horizontal incision is made in the lower portion of the abdomen. If an existing caesarean scar is present, the incision is made in this same area. After overhanging skin and fat are removed, the remaining skin is pulled tight and sutured together. No staples are used. A temporary drain is placed and is usually removed in 3-4 days. The first few days after a panniculectomy with liposuction you will have swelling and bruising. These symptoms will be eased with proper care and medication. Patients will be allowed to shower, but not immerse in a bathtub until drains are removed. A compression garment is worn from several weeks to months depending on the extent of procedure. Patients must avoid strenuous activity for a couple of weeks. Usually a week off work is recommended depending on the type of occupation you have. The scars incurred by the surgery will begin to look worse before they look better, but this is normal. They will fade as healing continues. After a few months, patients will really begin to see the results of the surgery and will look and feel better. Procedure costs will vary according to the frame size of each patient and the individual cosmetic needs of each patient. Mini tucks start at 6500.00. These fees include all pre and post surgical care, surgical fee, facility charge, anesthesia, surgical supplies and garment fee.